Keep your little one warm and comfy while wearing her favorite animal character as she wears this S.W.A.K. 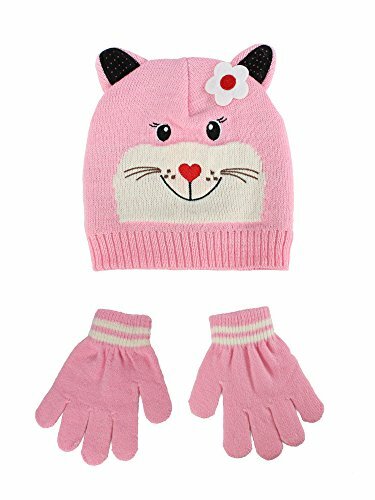 Toddler Girl’s Hat and Gloves Set! Made of 100% polyester knit fabric, these accessories offer an incredibly soft and gentle sensation while making sure that they are ideal for sensitive skin. The stretchy material fully covers your toddler’s ears, head, and hands, providing optimum warmth during the cold seasons. Lively and colorful embroidered animal characters and applique accents plus ribbed cuffs give off a cool and cheery vibe, and can be easily paired with almost any type of winter clothing. Having it as one-size-fits-most, you’ll never have to worry of a wrong size as these stretchy beanie and gloves fit most head and hand frames of children. A must-have in your child’s wardrobe!